Our unique industry offering is to bring together all of our core capabilities and offer a fully integrated structure package on key projects. This allows for a complete, uncomplicated, streamlined, cost effective offering that has not previously been available in the construction industry. SRG Global provide the complete package, from solving problems around how to construct more efficiently and in less time, to specialist technical expertise, innovative technology and equipment. This means you can leave us to get on with delivering the finished building. We are world leaders in this technology, which enables faster construction, a reduction in reinforcement, thinner and more economical slabs, larger floor spans and fewer columns. Our in-house construction design capacity allows us to customise the slab for every job, and we investigate multiple paths to reducing slab thickness, steel usage and construction times. Optimising the design for both concrete and steel usage saves time and money and minimises environmental impact. Customers choose SRG Global because we move quickly to solve even the most difficult problems, drawing on a depth of operational experience unparalleled in our industry. They can be confident that we have all the resources necessary to successfully manage even the biggest projects, including completing the structure as well as building and installing the facade. Acknowledged as concrete specialists, our building service includes all facets of formwork, including wall formwork, column formwork and falsework, reinforcement placement and post tensioning, and concrete pumping and placement. 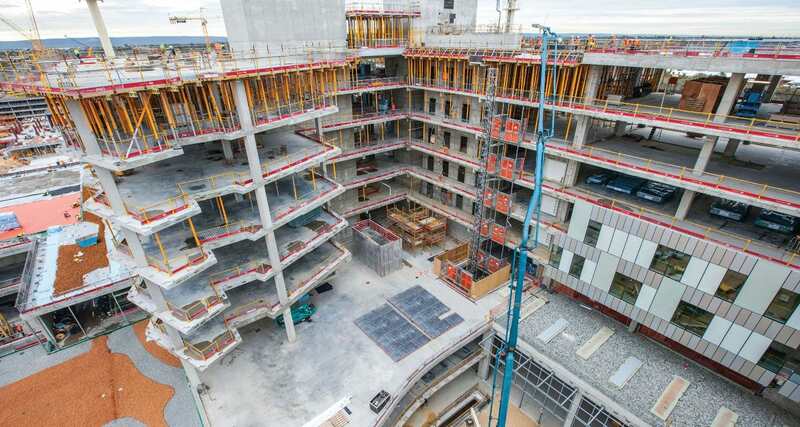 Our expertise in formwork, including slipforming, and in slab engineering, along with our end-to-end capability and our capacity to develop smarter solutions, means that customers can hand responsibility for the whole project to us with confidence. Architects and designers have clear ideas of what their finished buildings must look like, and the fabrication, construction and installation of the facade plays a critical role in this. Our long history of working directly with manufacturers who follow our own quality standards ensures that the design vision is realised no matter the size of the project. We don’t just take orders, we explore different materials and options, and suggest innovations. Our team designs and engineers the facade, with independent wind load testing, and develops a prototype which can be tested for the expected conditions. Having the same team involved from inception to opening saves customers time and money, and creates a single point of contact. As a leading supplier and contractor of scaffolding and access solutions, we have the engineering skills, qualified and experienced personnel, and material resources to tackle even the most complex access challenge. We can design and supply scaffolding to any type and scale, as well as swing stages and mechanical access, and provide rope access as an alternative to fixed scaffold. Large scale management packages for major projects in the oil and gas, resource or industrial sectors, include supply, storage, stock management, transport and maintenance of scaffold material at remote offshore and onshore locations.